Bailey was our foundation girl at Sassenach. 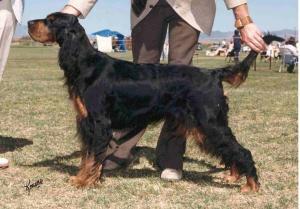 Bred by Dean and Jane Matteson, Ontario, California. When I approached them for a girl I asked for a good temperament, a good bite and good hips. I got all three, in a very cobby typey Gordon. Bailey was a wonderful baby sitter and playmate for Mathew and Robyn. Bailey taught me well in the ring, brought laughter and tears. A wonderful hospital visitation dog that enjoyed climbing up on the beds of people who needed quiet comfort. Bailey was probably the easiest of dogs to life with, you really never knew she was there, except when it came to meal times and you would be tripping over her all the time. I can still remember Dean Matteson giving me heck for phoning to arrange Bailey's arrival from my hospital bed after giving birth to my daughter Robyn. Dean and Jane always supportive of me with advice set me on the road to having a wonderful life with gordons and all the new friends I met because of them. After Bailey had completed her Canadian title I sent her home to Dean and Jane for a US title. Bailey was the first dog I had ever entered in a specialty. Dean phoned me on the Sunday night after a weekend of shows in Arizona to say he was sorry but I didn't have a US champion, however I did have a dog sitting on 14 points and three majors under her belt, did I want to leave her to get the last single before sending her home! This wonderful girl has a special place in my heart, I can still see her in the greatgrandkids that are in my home. I do however wonder why she didn't pass that low key profile on as the grandkids are all in your face dogs.